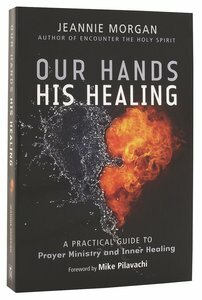 This book falls into three parts: getting started in prayer ministry; ministering healing from past hurts; prayer ministry as part of a holistic pastoral approach. It includes 'spiritual tools' that can be used, not in a formulaic way, but rather as an available resource as and when the Holy Spirit prompts. Throughout the book the reader is encouraged not to rely on what they know, but to be led by the Holy Spirit. There are also scriptures, biblical references and stories, plus illustrations of healing during prayer ministry. The tone is very practical, and deals with a range of knotty problems. The section on prayer ministry also includes ideas for 'homework' and exercises for the person coming for prayer. Chapters include subjects such as deliverance, belief systems, releasing suppressed anger and grieving at loss. Includes practical guidelines and bullet points. Suitable for training others in prayer ministry. About "Our Hands, His Healing"
Jeannie Morgan has been part of the Soul Survivor Watford Church team since it started 17 years ago and has also travelled for several years as part of the Soul Survivor international team teaching about prayer ministry. She has a passion to see Jesus set people free.